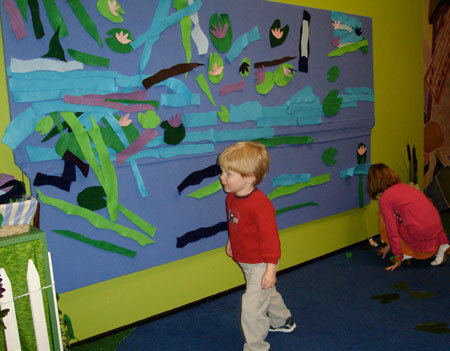 The kids re-create Monet's waterlillies using felt board and felt cutouts. ..and now on to Impressionism. There’s a girl dancing…a field of hay…a vase of pretty flowers…some waves…and…we’re done. Now let’s go paint something. 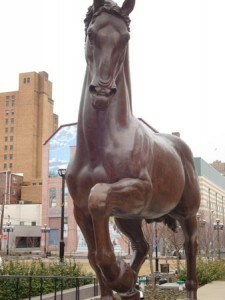 The horse sculpture outside the Allentown Art Museum. That was the art history lesson I had Sunday with my kids when we went to see Monet to Matisse: French Masterworks from the Dixon Gallery and Gardens at the Allentown Art Museum. Just like me, they didn’t feel the need to know exactly who painted what in exactly what year. They just knew if they liked it or not. My daughter wanted to see Degas’ paintings (girl = ballerinas! ), and she recognized the waterlilies of Monet that were featured in the Artways gallery. A few weeks ago serendipity led me to borrow The Magical Garden of Claude Monet by Laurence Anholt from our local library. We’ve since read storybooks about Matisse and Degas from the same author. They were a great set up to the exhibit. To my 2-year-old son, they were all rather ordinary pictures until we got to the 3oth Juried Show exhibit and Steve Scheuring‘s oil painting “Crash” spoked to his little tiny car-lovin’, truck-drivin’ soul. An entire painting of bright Hot Wheels! Does it get any better than that when you’re 2? Considering my kids are so young, I think they held out pretty long exploring Impressionism. Mind you, I wasn’t expecting to stand about with them discussing use of color or contemplating brush strokes. But my 5-year-old would have enjoyed the paintings a little longer if she wasn’t so focused on getting to the children’s interactive gallery. That’s what they enjoyed the most, though: painting scarves, using felt to make water lily gardens like Monet and painting with scissors like Matisse. I’m hoping to go back to the Allentown Art Museum and actually look at the paintings before the Impressionist exhibit leaves on May 3. Maybe I’ll even get to read about the paintings and relearn all that art history shelved in the back of my brain.